Provasil is manufactured by Cognetix Labs, which is part of Cognetix Inc. Cognetix Inc is a drug discovery company established in 1996 in Salt Lake City, Utah, USA. It produces and commercializes pharmaceuticals that are mainly based on peptides in the venom of marine cone snails and specializes primarily in the field of pain treatment. For advice and additional information about this supplement or helpful tips, you can contact the manufacturing company directly at the following phone number: 1-888-211-8468. 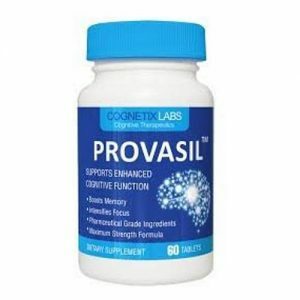 The ingredients found in Provasil formulation are: Folic Acid, Vitamin C as ascorbic acid, Vitamin B12 as cyanocoblamin, L-Tyrosine, Biotin, Choline Bitartrate, N-Acetyl-L-Carnitine, Phosphatidylserine, Ginkgo Leaf, Bacopa Monnieri, L-Glutamine, Phosphatidylcholine, Resveratrol as polygonum cupidatum extract, Panax Ginseng Root (Asian Ginseng), DHA (Docosahexaenoic Acid). Other ingredients: Stearic Acid, Di Calcium Phosphate, Microcrystalline Cellulose, Magnesium Stearate, Croslose Sodium, Silicon Dioxide, Coating (carmelpolyethylene glycol, Hydroxypropyl methylcellulose, titanium dioxide, Opadry®). Provasil comes in a 60 tablets presentation. It is recommended that you take 1 or 2 tablets a day so you can benefit from all of Provasil’s great effects. Provasil does not have a particular target public so it can be used by anyone that wants to keep a sharp mind. Provasil has three main benefits: Memory boost, intensified focus, and increased mental performance, due to the combination of over 15 different molecules that have been associated with heightened brain function, increased mental alertness and lack of sleep, memory improvement, memory loss improvement and the treatment of some symptoms of Alzheimer’s disease. However, it must be remembered that Provasil it’s not intended to cure or treat any disease. There are very few opinions shared by the customers who have tried this brain supplement. Some of the reviews are positive, but there are also many customers claiming the product did not work for them. Provasil brain booster supplement can be found at a high price over the internet. Before using Provasil or any other dietary supplements you should consult with your doctor. No evidence of Provasil side effects can be found from customers who have tried it. Provasil ingredients and concentration give the indication that there is a low chance of showing any side effects. Provasil can be ordered online from different places but our recommendation is to either buy it directly from the manufacturer or purchase it from trusted online retailers which may offer you discounts. We did a research on other products from Cognetix Labs. Here is a complete list.